Moving to Vermont provided my first real experience driving in snow. I learned to drive in Northern Virginia, where life shuts down when the first snowflakes fall and you don’t drive anywhere. I didn’t have a car during college in Western Massachusetts, or throughout my post-college life in New York City. When I finally became a regular driver, in the San Francisco Bay Area, there wasn’t any snow. The ability to drive in snow is often held up as something separating the weak from the strong. “They don’t know how to drive in the snow!” people in snow-prone areas scoff when speaking about those in warmer climes. And the people who live in warmer climes don’t disagree; “They really know how to handle the snow,” they say admiringly of those whose lives aren’t upended by a dusting of snow. In truth, I don’t think driving in the snow requires special talent. Like most abilities, it’s something that you learn to do because you have to. If someone can’t drive well in the snow, it’s probably because they’ve never really been given the chance. -Prepare in Advance: Skill only takes you so far; if you live where it snows in the winter, there are some simple things you can do to prepare for the inevitable – things that will make driving easier when the snow comes. In late fall, we put snow tires on our car. 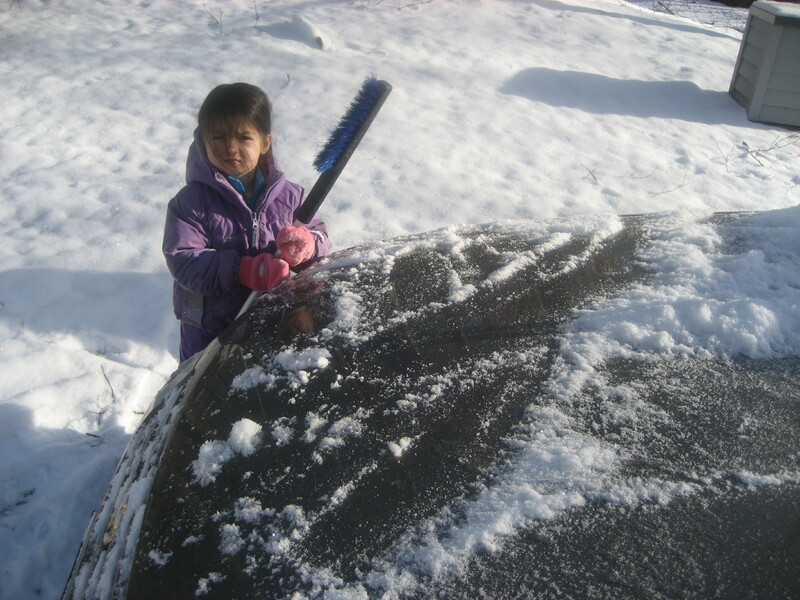 We make sure that we have ice scrapers in the trunk. We also get a hot oil undercoating, which I’d never heard of until we moved to Vermont. It sounds like a bizarre spa treatment, but it involves treating the underside of your car with hot oil to form a crust, so that the road salt doesn’t rust out the undercarriage. -Use Your Head: Just because you live in a place where “they know how to handle the snow,” doesn’t mean that you have to go OUT in the snow. There are times when common sense will tell you that it’s best to sit tight until conditions improve; listen to your common sense. While visiting us this winter, my parents decided to return to Virginia in the middle of a blizzard. Eleven hours later, they called to lament about the condition of the roads. “We figured it was Vermont,” they said, “and that Vermonters would keep the roads clear.” It doesn’t matter where you are: if you drive in a blizzard, you’re going to drive in blizzard conditions. In driving, as in life, it pays to expect the obvious. That is NOT the way to drive in snow. Driving in the snow, you have to take your time and be hyper-alert. You notice everything. Not a bad way to go through life, either. -Pump the Brakes: Sudden stops in the snow can cause your brakes to lock up and your car to skid. The best method is to anticipate intersections and turns, and to avoid sudden moves. Gently pumping the brakes when bringing your car to a stop or taking a curve is the way to go. This is also a good rule for approaching life’s metaphorical intersections. -Turn into the Skid: If you drive in the snow, chances are that sooner or later you’ll find yourself skidding, no longer in control of your vehicle. When this happens, most people’s instinct is to panic and turn the wheel in the opposite direction – to reassert control. This will, in fact, only make things worse. When you find yourself in a skid, what you actually need to do is remain calm and, against your instinct, turn your wheel towards the skid. This will enable your car to regain traction. In other words, sometimes it’s best to give up control and to head towards the very thing we fear. -Don't Try to Make People Like You: I’m especially guilty of breaking this rule. I’ll be driving along, following all of the rules above, but if I sense that the car behind me is annoyed with my driving – that I’m going to too slowly, too carefully – I get flustered. I’ll speed up a little, trying to make the other driver happy, then speed up a little more. When, in fact, it doesn’t matter one bit what other cars on the road think of my driving. The only thing that matters is getting my car and its precious cargo home safely. So, there you go: my six keys to life and snow driving. See you on the road! I’ll be the one driving too slowly, with the Disney Princess music cranked up full blast. Faith Gong has worked as an elementary school teacher, a freelance photographer, and a nonprofit manager. Since moving to Addison County in 2011, her work has involved caring for a house in the woods, three young daughters (with another on the way), one adorable puppy — and writing for her blog, The Pickle Patch.